Ten years ago when the wool market was depressed, Margaret Magruder decided to come up with an alternative use for wool to turn the market around. 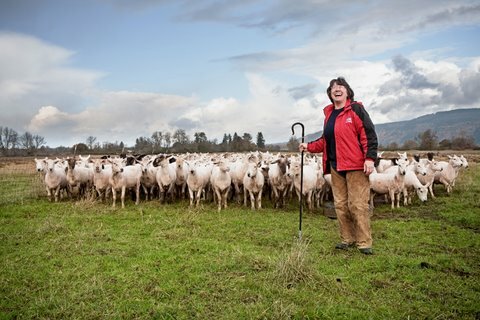 Magruder has been a sheep farmer at Magruder Farms the last 30 years in Clatskanie, Oregon, the farm she grew up on started by her grandfather in the early 1900s. “I tried to leave many times but it kept pulling me back,” says Magruder of the family farm. She attended Willamette University to receive her Bachelor’s and Syracuse University in New York for her Master’s, but her heart remained on the farm. When the wool market was experiencing a rough patch, threatening the livelihood of her 100-year-old family farm and the industry as a whole, Magruder took a proactive approach to the situation. Joel Pynch, a sheep producer and longtime friend of Magruder’s was the first to step up for her initiative. “Joel came up to me after a meeting I was speaking at and said, ‘I’m your man,’” says Magruder. That was the beginning of a business partnership between Joel and his wife Kay Pynch and Magruder, which led to the start of a company in 2002 called Oregon Shepherd, natural wool insulation. The idea for wool insulation came from a committee of ag industry professionals that was assembled by Magruder and the Pynchs, including wool processors, extension service people and farm service agency representatives. The committee came up with several ideas, pet beds and weed control fabric, but wool insulation prevailed. They spent a significant amount of time applying for grants and received a sustainable research grant, funding assistance from the American Sheep Industry and a U.S. Department of Agriculture value-added producers’ grant from the Oregon Department of Agriculture. The next few years they researched and tested natural wool insulation and how to produce it. They discovered that wool insulation is an extremely sustainable and environmentally-friendly option for homes. When they had the process figured out, they started producing the insulation in Rainier, Oregon, and were ready for sales. “It has increased my appreciation for anything on a shelf, because it doesn’t get there easily,” says Magruder. “We’re pretty specialized, we have a small target market. It’s not what everyone wants,” she says. The product attracts consumers who prioritize a sustainable, environmentally friendly way of living. Oregon Shepherd insulation is made from 100 percent natural wool, using wool from sheep all over the U.S., including Magruder Farms. The insulation is made from the coarser fibers that are not ideal for clothing through a very simple process. First, the wool is sent through a granulator to chop it up. Then it is moved through the system by air, and a borate solution is applied to increase flame and pest resistance. Then the wool goes through a cyclonic air separator and is packaged and shipped. The energy required to produce Oregon Shepherd insulation is less than 10 percent of the energy required to produce traditional insulation materials. It is a sustainable and renewable resource since sheep grow a new crop every year. Wool is completely recyclable and can be remanufactured, reused, or biodegraded. Wool does not deteriorate and it holds its shape, so the insulation lasts forever. Because of the crimped nature of wool, when wool fiber is packed together, it forms millions of tiny air pockets which trap air and in turn serves to keep warmth in during winter and out in the summer. Oregon Shepherd is proud to be the only facility in the U.S. that produces a wool insulation product that meets the building code requirements. The company has shipped product to Hawaii, Alaska, Vermont, and Canada and is popular with purchasers of “tiny houses,” a social movement where people are downsizing the space that they live in to homes as small as 400 square feet. No matter how big Oregon Shepherd might get, Magruder Farms will always be a priority. “I love what I do, I love agriculture because it’s such an important part of everyone’s life. I think food production is the basis of not only our economy but our health and safety. So I’m very proud to be part of that food production chain,” says Magruder.